The story of Second Baptist’s birth is a fascinating tale of God setting His vision and plans before ordinary men and women. Before Second was organized on March 1, 1885, God moved in the hearts of four men who would prove to be vital in starting the church. Businessmen Milton Bowerman (for whom a Springfield school is named), J.J. Bryning, Peter Imler, and L.A. Newton felt a new church was needed. In 1882, these four members of First Baptist, Springfield, initiated efforts to start a Baptist mission north of Springfield. On March 1, 1885, the new church was duly organized. The first building was completed on July 4, 1886. On this day the congregation, led by Richard Armstrong playing his trumpet, sang “Onward Christian Soldiers” as they marched from their rented facility, the Frisco Opera House, to the new edifice at 1616 North Robberson. By the time services were held in the new location, the church had 90 members. The new building was long and narrow with a balcony. The baptistry was under the pulpit. When there was a baptism, the pulpit was moved aside, and the floor was pushed back. The members and leaders of Second Baptist have made many important decisions. 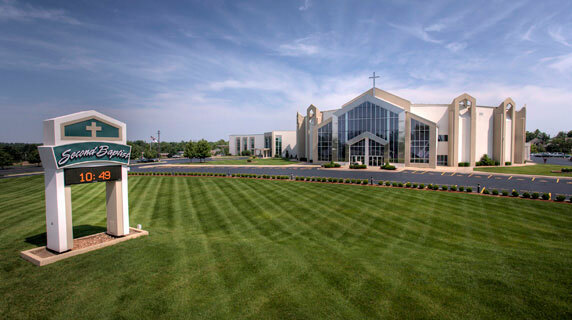 Two of the most difficult and most important choices entailed relocating the church plant from North Robberson Avenue to South Oak Grove Avenue in 1960, and from South Oak Grove to 3111 E. Battlefield Road in 1990. The stalwart members of Second who led in these ventures have never stood taller. We are grateful to our Heavenly Father for a united people who gave their best to further the Kingdom of God. They showed us the way. By seeing tomorrow through yesterday’s eyes, we can build on the faith experiences of our forebears and enter our future confident God will continue to bless Second. The follow paragraph, taken from an anonymous writing found in the church papers and believed to have been written in 1915, expresses our sentiments as we contemplate the past and future of Second Baptist Church, Springfield, Missouri.